To help open & stimulate the third eye (Ajna Chakra) and shift subtle energy patterns all over the body. 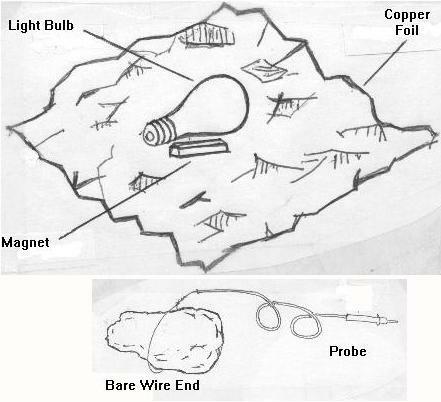 Described on p. 25 of Other Kingdoms by M. B Cooke (copyright Marcus Books 1981): Krypton-containing lightbulb, magnet, copper foil, insulated probe with wire, and instructions. We like copper foil better than aluminum foil. Sleep: He 90%, Ne 10%. For improved sleep. Clearing: Ar 70%, Kr 30%. For destruction of negative thought-forms, person already has great ease falling asleep. Clearing + Sleep: He 10%, Ar 60%, Kr 30%. For destruction of negative thought-forms AND to reduce some difficulty falling asleep. For amusement purposes only. No medical or therapeutic claims made or implied for any of the inert gas devices. Can contain any inert gas or combination of gases, except for Xenon. That is because in the last year, Xenon prices have tripled, and they continue heading up! If you'd like Jon to briefly channel the correct combination, please click here (there's no extra charge), for the instructions. Please allow 10 days after ordering. Teeth: 18% He, 36% Ne, 46% Xe, as described in Symbols, page 35, channeled by Maurice B. Cooke. For regeneration of teeth. Consciousness: Ar 10%, Kr 10%, Xe 80%. For general enhancement of consciousness, psychic development, person already has great ease falling asleep. Consciousness + Sleep: He 10%, Kr 10%, Xe 80%. For general enhancement of consciousness, psychic development, person has some difficulty falling asleep. All 5: He 20%, Ne 20%, Ar 20%, Kr 20%, Xe 20%. Equal parts all 5 gases - all-purpose mixture. Why the extra charge for Xenon? Xenon prices are now much higher than the other gases. Sorry! Can contain any inert gas or combination of gases, including Xenon. Why more for Xenon? Xenon prices are now much higher than the other gases. If you'd like Jon to briefly channel the correct combination, please click here (there's no extra charge), for the instructions. If the channeling indicates that no Xenon is needed, then you will be charged the lower "No Xenon" price. Please allow 10 days after ordering. Tested at full pressure and then shipped empty, for your own research. Please allow 10 days after ordering. 18% Helium, 36% Neon, 46% Xenon. This is our most requested special combination of inert gases in the Omni. Please allow 10 days after ordering. We can empty out an Omni we supplied to you previously, and refill it with 18% Helium, 36% Neon, 46% Xenon. This is our most requested special combination of inert gases in the Omni. Please allow 10 days after we receive the Omni from you for us to refill. 60% Krypton, 40% Xenon. Please allow 10 days after ordering.